We used an ITS2 primary and secondary structure and Compensatory Base Changes (CBCs) analyses on new French and Spanish Dunallela salina strains to investigate their phylogenetic position and taxonomic status within the genus Dunaliella. Our analyses show a great diversity within D. salina (with only some clades not statistically supported) and reveal considerable genetic diversity and structure within Dunaliella, although the CBC analysis did not bolster the existence of different biological groups within this taxon. The ITS2 sequences of the new Spanish and French D. salina strains were very similar except for two of them: ITC5105 "Janubio" from Spain and ITC5119 from France. Although the Spanish one had a unique ITS2 sequence profile and the phylogenetic tree indicates that this strain can represent a new species, this hypothesis was not confirmed by CBCs, and clarification of its taxonomic status requires further investigation with new data. Overall, the use of CBCs to define species boundaries within Dunaliella was not conclusive in some cases, and the ITS2 region does not contain a geographical signal overall. The Internal Transcribed Spacer 2 (ITS2) of the nuclear rDNA cistron is one of the most frequently used regions for phylogenetic analysis in algae [1–3]. Although its application in deep taxonomic levels was initially limited to comparisons of genera within the same family owing to uncertainties in alignment at higher taxonomic levels, the analysis of its secondary structure has provided key solutions to this problem . Thus, the use of an ITS2 secondary structure improves sequence alignments, resulting in a higher robustness and accuracy of phylogenetic reconstructions  and providing help to distinguish species . Furthermore, an automatic approach to analysis is possible , as a pipeline consisting of the ITS2 Database (annotation/structure prediction), 4SALE (alignment), ProfDistS (inferring phylogenies) and the CBCAnalyzer (distinguishing species) have recently become available (http://its2.bioapps.biozentrum.uni-wuerzburg.de/?about). In Dunaliella (Chlorophyceae), the use of ITS2 secondary structure for phylogenetic analysis has a long tradition [8–13]. The genus Dunaliella comprises twenty-eight recognized species separated in two subgenera, Pascheria (which contains the freshwater species), and Dunaliella (grouping the marine species); the latter is further subdivided into four sections: Tertiolecta, Dunaliella, Viridis and Peirceinae . The species ascribed to these four sections occur in a wide range of marine habitats such as oceans, brine lakes, salt marshes, salt lagoons and salt water dishes near the sea , being Dunaliella salina Teodoresco (section Dunaliella) the most studied one. Dunaliella salina, is the most halotolerant eukaryotic photosynthetic organism known to date [14, 15] since it shows a remarkable degree of adaptation to a variety of salt concentrations and it accumulates large amounts of carotenes under extremely stressful conditions such as high salinity, low nitrogen levels, and high solar radiation . Nowadays, it is the best commercial source of natural β-carotene [14, 16], and it also stands out as a source of glycerol . One of the aspects of D. salina that have most intrigued researchers is the enormous variability within strains regarding its geographic, physiological, and morphological characteristics [18–24]. 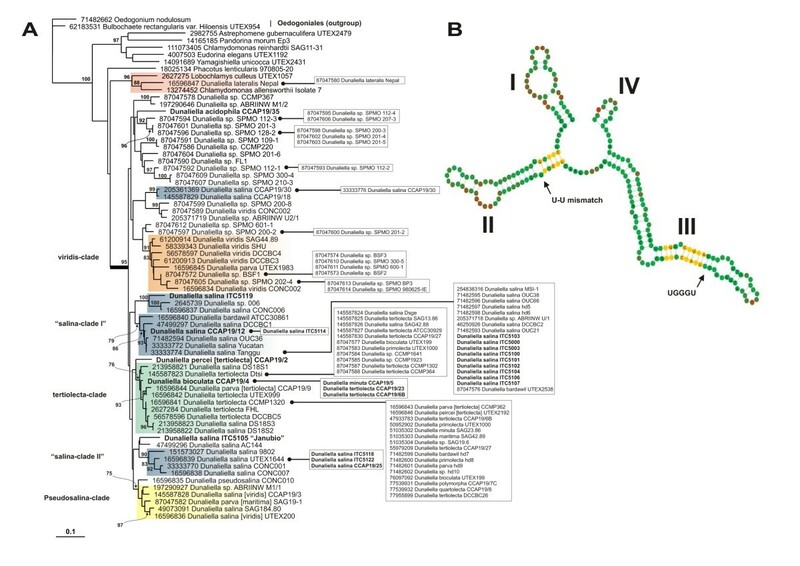 Recent phylogenetic analyses of ITS1+ITS2 combined with the analysis of the ITS2 secondary structure of D. salina strains have also revealed a high intraspecific variation [8–11, 25]. The high genetic diversity detected in D. salina, its morphological plasticity, and the restricted geographical sampling used in all scientific publications to date have hindered taxonomic elucidation in this taxon. Our objectives are (1) to use the ITS2 sequences and secondary structure analysis in a thorough geographic and taxonomic representation of the genus Dunaliella and particularly D. salina (including new Spanish and French strains) to improve understanding of the complex phylogenetic structure in this taxon, (2) to study the relationship of the new strains with the Dunaliella sequences available at the ITS2 Database and/or at GenBank ; (3) to investigate if the Compensatory Base Changes (CBCs) analyses could elucidate the species concept in Dunaliella, and reveal potentially new species; and (4) to test if D. salina ITC5105 "Janubio" could be considered a new species. The ITS2 primary and secondary structure phylogenetic analysis of all the Dunaliella sequences available in the ITS2 Database plus the new sequences revealed great heterogeneity, although some of the clades were not statistically supported (Figure 1). No phylogenetic relationship is supported between the two Dunaliella freshwater species, since D. lateralis was positioned outside the Dunaliella subgenus, while D. acidophila was positioned within this subgenus. Sequence-structure tree and consensus structure of ITS2. (A) Sequence-structure Neighbor-Joining tree obtained by ProfDistS and supporting bootstrap values (100 replicates). Strains on the right written within squares have identical ITS2 sequences. Strains written in bold were sequenced in this study. All strains information can be found in Supplementary Table 1 (B) Consensus structure (51%) for all ITS2 sequences obtained from the complete multiple sequence-structure alignment without gaps. Helices are numbered I-IV. Sequence conservation is indicated from red (not conserved) to green (conserved). Nucleotides which are 100% conserved in all sequences are written as A, U, G or C. Nucleotide bonds which are 100% conserved throughout the alignment are marked in yellow. The figure was generated with 4SALE . The strains positioned in the tertiolecta-clade represent species that belong to different traditionally accepted sections: section Tertiolecta (D. tertiolecta, D. primolecta, D. quartolecta, D. polymorpha), section Viridis (D. bioculata, D. minuta), section Dunaliella (D. salina, D. parva), and section Peircei (D. percei). The majority of these strains had an exact ITS2 sequence (Figure 1). Most D. viridis strains sampled were positioned in a single clade; however, some strains (UTEX200, CCAP19/3) were positioned in a different clade together with D. pseudosalina CONC010 (pseudosalina-clade), but without statistical support. The majority of the D. salina strains were distributed in two different clades (salina-clade-I and salina-clade II), positioned between the tertiolecta sub-clades, whereas two D. salina strains (CCAP19/30, CCAP19/18) were positioned together in a different clade. Only two of the new ITS2 D. salina sequences, ITC5119 ("salina-clade-I") and D. salina ITC5105 "Janubio" (salina-clade II), had a unique ITS2 sequence profile (Figure 1). The CBC analysis of the ITS2 secondary structure showed that there is at least one CBC between "Janubio" and the other D. salina strains analyzed (see Additional file 1), except D. salina CCAP19/30 and CCAP19/18; however these two strains were phylogenetically distant to Janubio. The taxonomic identification of the Dunaliella sp. strains (below the D. acidophila strain in Figure 1) was not possible because they did not match with any known Dunaliella species. Despite the phylogenetic tree indicates that this group may indeed represent a new species; the analysis of the CBC did not confirm these results (Additional file 1). We observed a lack of CBCs in some strains when we compared species in different clades: viridis vs salina, viridis vs tertiolecta, salinas vs tertiolecta, salina vs salina, etc (Additional File 1). Also, the CBC analysis of the different species within the subgenus Dunaliella for the confirmation of the species boundaries was not conclusive in some cases (Additional file 1). The phylogenetic results of the ITS2 sequences in this study, and previous confirmed identification of some Dunaliella strains (see Table 1), allow us to suggest the re-identification of some strains (Table 1). Taxonomic classification, Culture Collection, Geographic Origin and GenBank acession numbers of the strains included in this study. Asterisks indicate the strains sequenced in this study. Underlined strains correspond to identical isolates stored in different culture collections. Acronyms: Culture Collection of Algae and Protozoa, UK (CCAP); Sammlug von Algenkulturen, Germany (SAG); University of Texas Culture Collection of Algae, USA (UTEX); American Type Culture Collection, USA (ATCC); Dunaliella Culture Collection at Brooklyn College, USA (DCCBC); Provasoli-Guillard National Centre for the culture of Marine Phytoplankton, USA (CCMP); Universidad de Concepción, Chile (CONC); Banco Canario de Algas, Spain (BCA) ; Instituto Tecnológico de Canarias, Spain (ITC). Finally, the ITS2 data was not informative regarding the geographic origin of the D. salina strains. The ITS2 Database allows automatic large scale simultaneous analyses of both ITS2 sequences and their secondary structures. Potential pitfalls are in structures obtained by different algorithms; however the main difficulty of performing a phylogenetic analysis of the genus Dunaliella is the misinformation available at Culture Collections and GenBank regarding the identification of strains and sequences. The tracking of the true identification of each strain was only possible after consulting several publications where the authors concluded that they were misidentified and suggested their re-identification [9, 10, 27]. In this study, we have also suggested the re-identification of some strains based on our ITS2 data. To overcome all these unnecessary problems (and given that it is unlikely that all the Dunaliella strains could be openly available), we suggest to establish a "type strain" for each Dunaliella taxon (including subspecies, forms or varieties). These basic data should be easily obtained from any official culture collection, thereby greatly facilitating comparison with new field isolates and avoiding misleading information and/or false conclusions. Our ITS2 phylogenetic analysis of Dunaliella reveals several major groups, and positions the freshwater D. lateralis clearly outside Dunaliella, confirming that it no longer should be considered a member of this genus . Nevertheless, the other freshwater species analyzed in this study (D. acidophila, CCAP19/35), maintained its position within the subgenus Dunaliella, and was not phylogenetically related to D. lateralis, as recently proposed . Furthermore, the observation that different species belonging to several Sections (Tertiolecta, Viridis, Dunaliella and Peircei) share the exact same ITS2 sequence, make us believe that they correspond to a single species. These data agree with other authors [10, 11, 27, 29], who suggested that the number of Dunaliella species may be much lower than it has been claimed till now. The possibility that the ITS2 gene is not able to discriminate between these species is highly unlikely; therefore, our observations support the suggestion that the morphological and physiological criteria available to discriminate Dunaliella species are either not very reliable , or are difficult to interpret.. In an attempt to clarify the species concept within Dunaliella, we searched for compensatory base changes (CBCs). Several case studies have revealed that the detection of a CBC in the ITS2 secondary structure between two organisms is correlated with sexual incompatibility [6, 30, 31], and these changes have been proposed as markers for distinguishing species [6, 7, 30, 31]. In summary, these investigations conclude that while a CBC in a pair of sequences is positively correlated with species distinctness at a confidence level of 93%, the lack of a CBC in the ITS2 secondary structure does not necessarily indicate that two organisms belong to the same species . The overall analysis of the CBC was not able to elucidate completely the species boundaries within the different groups of Dunaliella, since in some cases it was observed that there was a lack of CBCs between known distinct species. In the special case of D. salina, high variation levels have been reported for decades [19–24]. However, only Massjuk  translated geographical, physiological, and morphological variables into the recognition of two subspecies (D. salina sp. salina and D. salina sp. sibirica Massjuk and Radch.) and three forms (D. salina sp. salina f. salina, D. salina sp. salina f. oblonga Lerche, and D. salina sp. salina f. magna Lerche). Later on, ITS2 phylogenetic analyses suggested the existence of two distinct phylogenetic species within the taxonomic entity currently known as D. salina [10, 11, 32], indicating the possibility of cryptic speciation . Our ITS2 phylogenetic analysis does confirm the existence of three different groups within D. salina; however, the CBC results did not resolve if these groups may correspond to distinct species, although several strains of each D. salina group shared one CBC with D. salina strains in other groups. On the other hand, the high morphological and physiological variability found within the Spanish D. salina strains under the same lab conditions  was not correlated with the phylogenetic observations of this study. This finding indicates that the phylogenetic closeness found with ITS sequences does not reflect common physiological or morphological attributes. Moreover, our data unequivocally suggest that D. salina is not monophyletic, at odds with previous hypotheses [10, 11, 32]. The other objective of this work was to elucidate if the physiological uniqueness found in "Janubio" [such as its unique fatty acid profile and accumulation of high levels of carotenes under low light flux density conditions; Mendoza et al. : A new strategy for carotenogenesis under conditions of cellular stress in Dunaliella (a Potential New Species), submitted] could be confirmed by the ITS2 data and the CBC analysis. However, although we observed that this strain has a unique ITS2 sequence profile, and had more than one CBC with the other phylogenetically related D. salina, our data do not allow us to conclude that this is a new species, and further studies must be performed to find out if the differences observed are just reflecting a high intra-specific variability. Finally, in agreement with previous studies [8, 11, 25], our ITS2 data failed to furnish evidence for isolation by distance among D. salina strains. This work demonstrates that the taxonomy of Dunaliella should be revised. The great diversity observed within the ITS2 sequences of D. salina suggests that different biological groups may exist within this taxon; however, this was not confirmed with the CBC analysis. Likewise, although the Spanish D. salina strain ITC5105 "Janubio" was characterized by a unique ITS2 sequence, the hypothesis that it may be a new species could not be confirmed by the CBCs analysis, requiring further morpho-physiological and genetic investigation. Overall, the use of CBCs to define species boundaries within Dunaliella was not conclusive in some of the cases assessed. We sequenced the ITS2 region of 13 D. salina strains from Spanish and French saltworks, one strain obtained from the Culture Collection of Algae and Protozoa UK (CCAP), and one D. salina strain that has been maintained in the Instituto Tecnológico de Canarias (ITC henceforth) for several years (purchased from CCAP as Dunaliella salina 19/30). We also sequenced other Dunaliella species (D. minuta CCAP19/5, D. tertiolecta CCAP19/23 and CCAP19/6B, D. bioculata CCAP19/4) [Table 1]. The sequences of the other strains analyzed in this study were obtained from the ITS2 Database (http://its2.bioapps.biozentrum.uni-wuerzburg.de/?about). Detailed information about the strains used in this study can be found in Table 1. DNA extraction was performed with a chelex-100 (Biorad, CA, USA) resin-based protocol . For the DNA amplification of the ITS region, primers AB28 and TW81 in Goff et al. (1994)  were used. DNA amplification was carried out in a total volume of 25 μl with 1X iQ SYBR Green Supermix (Biorad, CA, USA) and 10 pM of each primer in a Smart Cycler thermocyler (Cepheid,CA, USA) as follows: 5 min at 94°C; 5 cycles of 1 min at 94°C, 2 min at 50°C and 1 min at 72°C; 30 cycles of 1 min at 94°C, 1 min at 62°C and 1 min at 72°C, with a final extension of 5 min at 72°C. PCR products were first electrophoresed in a 1.5% agarose gel to assure that a single band of 500-600 bp was present, then purified using the Real Clean Spin kit (REAL, Durviz S.L.U., Valencia, Spain), and finally bi-directionally sequenced on an ABI PRISM 3730xl automatic sequencer (Applied Biosystems, CA, USA) at the DNA sequencing services of Macrogen (Korea). Sequences and their individual secondary structures were obtained from the ITS2 Database [35–37]. Newly obtained ITS2 sequences were annotated according to Keller et al. , and their secondary structures predicted by homology modeling . The phylogenetic analysis followed the procedure outlined in Schultz and Wolf  in accordance with Keller et al. . The software used for the ITS2 sequence-structure analysis can be obtained from http://its2.bioapps.biozentrum.uni-wuerzburg.de/?about. A global, multiple sequence-structure alignment was generated in 4SALE v1.5 [40, 41]. The sequences and their individual secondary structures were synchronously aligned making use of an ITS2 sequence-structure specific scoring matrix , and the start and end of the alignment was manually adjusted. Based on primary and secondary structure information, phylogenetic relationships were reconstructed by ProfDistS, through the use of an ITS2 specific, general time reversible substitution model [42, 43]. Bootstrap support  was estimated on 100 pseudo-replicates. The resulting tree was visualized with TreeView . To study the species boundaries within Dunaliella we followed the "distinguishing species" instructions  based on compensatory base changes (CBCs) in the ITS2 secondary structure, and we used the CBCAnalyzer option implemented in 4SALE. This research was supported by BANGEN-"Banco Genético de la Macaronesia", MAC/1/C070 (INTERREG-IIIB). We thank the Cabildo de Gran Canaria for allowing us to collaborate with the Departamento de Biodiversidad Molecular at the Jardín Botánico Canario "Viera y Clavijo"- Unidad Asociada CSIC, and for continuous support to all its research lines. We would like to thank Matthias Wolf (University of Würzburg) for helping with the ITS2 sequence-structure analysis and to Frank Förster (University of Würzburg) for alignment adjustments. PA carried out the laboratory work, the phylogenetic analysis and wrote the manuscript. RJ-M and JC-C helped with the phylogenetic analysis and revised the manuscript. HM, AJ, LC and KF isolated the Dunaliella strains and revised the manuscript. HM conceived the study. All authors have read and approved the final manuscript.